During Question Period on 13 June 2016, Scott Reid, MP for Lanark-Frontenac-Kingston and Conservative Shadow Minister for Democratic Institutions, referenced my article “Time Has Already Run Out On Electoral Reform”, published by the Macdonald-Laurier Institute’s Inside Policy. I am pleased that he promoted my argument on the official parliamentary record and gave positive coverage of the Macdonald-Laurier Institute’s excellent journal! You can read this exchange in the original Debates on the website of the House of Commons. You can also watch the exchange on CPAC, starting at 17:45 and see Scott Reid breathe life into my words. When it comes to electoral reform, Mr. Speaker, the Liberals give a whole new meaning to the phrase, “a penny for your thoughts”. Here is why a referendum is essential. 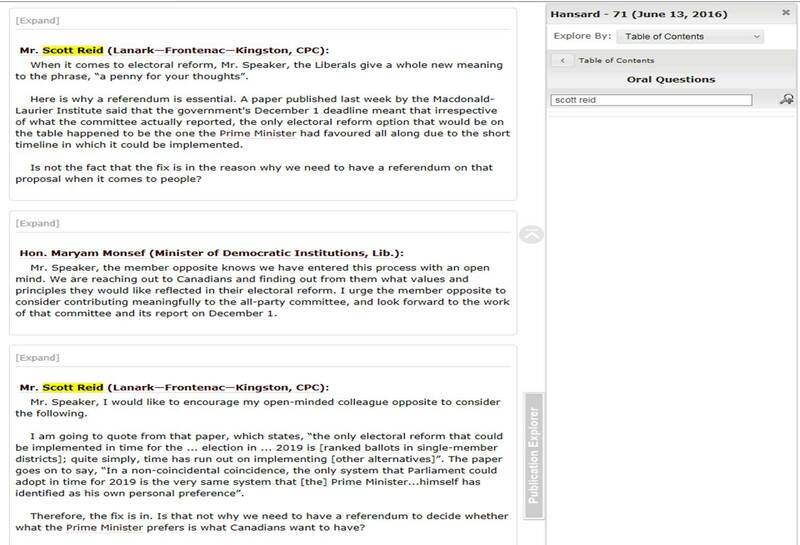 A paper published last week by the Macdonald-Laurier Institute said that the government’s December 1 deadline meant that irrespective of what the committee actually reported, the only electoral reform option that would be on the table happened to be the one the Prime Minister had favoured all along due to the short timeline in which it could be implemented. Is not the fact that the fix is in the reason why we need to have a referendum on that proposal when it comes to people? Mr. Speaker, the member opposite knows we have entered this process with an open mind. We are reaching out to Canadians and finding out from them what values and principles they would like reflected in their electoral reform. I urge the member opposite to consider contributing meaningfully to the all-party committee, and look forward to the work of that committee and its report on December 1. After the Minister’s rhetorical gymnastics of ambiguity, Reid then asked a follow-up question and quoted the concluding line of my article. Mr. Speaker, I would like to encourage my open-minded colleague opposite to consider the following. I am going to quote from that paper, which states, “the only electoral reform that could be implemented in time for the … election in … 2019 is [ranked ballots in single-member districts]; quite simply, time has run out on implementing [other alternatives]”. The paper goes on to say, “In a non-coincidental coincidence, the only system that Parliament could adopt in time for 2019 is the very same system that [the] Prime Minister…himself has identified as his own personal preference”. Therefore, the fix is in. Is that not why we need to have a referendum to decide whether what the Prime Minister prefers is what Canadians want to have? Mr. Speaker, while I appreciate and admire the member opposite’s respect for the media, which I share, I believe our responsibility is to reach out to experts and academics to hear from members of our free and independent press, but also to reach out to our communities and to hear from our constituents how they would like to see their democratic institutions modernized. I look forward to that kind of insight and that kind of feedback from the member opposite. It is very amusing to learn from the Minister for Democratic Institutions that I am now part of “the media” in this country; that is an honour that I could very much do without. If the Minister truly believes that she has a “responsibility to reach out experts and academics,” then she ought to pay close attention to my arguments and Emmett Macfarlane’s. Congratulations James. The Conservative Party has the most to lose from a Preferential Ballot which would make it almost impossible for the Conservatives to get a Majority Government. As a side note; the vote by PIG MPs today to unilaterally change Canada’s National Anthem — without consulting Canadians — is just another reason why I hate politicians! MP Mauril Bélanger is no longer performing his duties as an MP, and needs to resign his Seat. Being a Member of Parliament is NOT a $160,000 / year welfare check! Politicians don’t care what people think or want which is why they’re rushing through electoral reform.